Thirteen other fan bases around the league can fume as much as they please, but the fact remains that the Cleveland Cavaliers won the NBA Draft Lottery Tuesday night for the second time in three years. Also, as much as those other fan bases say, the Lottery is –in fact –not rigged (see below). 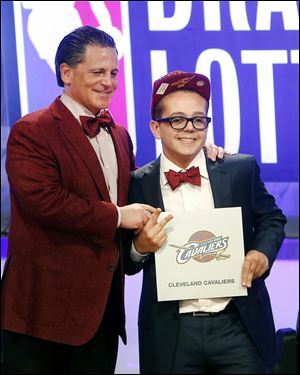 Yet the order is now set, and every draft prospect who’s hoping to hear their name called on June 27 will probably sport bowties and jackets (that make them look like Mayor McCheese) for the next few weeks in the hopes of impressing Dan Gilbert & Co.
With that in mind and the Draft now just over a month away, we here at NBA Rookie Class have come up with our top three winners and losers from the Tuesday night’s drama. Anytime you win the Draft Lottery two times in three years, you must be doing something right…well, technically wrong; however, the Cavaliers (represented by possibly the largest, most talkative, and luckiest good luck charm of the 21st century, Nick Gilbert) defied the odds once again, and landed themselves the first overall pick. With the selection, the Cavs have a plethora of options; they can continue to one of many solid young athletes to their already overflowing cup of good youthful players (i.e. Kyrie Irving, Dion Waiters, Tristan Thompson, Cody Zeller, etc.) or they can play it smooth and trade down for a savvy veteran player that may finally remove them from the Lottery process and push them into the playoffs. The choice belongs to Gilbert, and it seems as though he couldn’t go wrong either way. Anytime ESPN is sitting next to you in your own living room while a live event with the word “Draft” in it is currently unfolding on your television, it’s usually a good thing. Noel, one of the top prospects of the 2013 NBA Draft, had this exact treatment Tuesday night, when the big four letter corporation caught his every action and reaction on film before interviewing him in regards to how he thought the evening played out. This bodes well for Noel, as ESPN has interviewed the top overall pick during the last two broadcasts of the NBA Draft Lottery broadcasts: Irving in 2011 (who was attending the event himself), and Anthony Davis in 2012 (who was also interviewed from home). While his offensive skill set doesn’t put him in the same class as Kareem Abdul-Jabbar or Patrick Ewing, Noel’s ability and potential to be a defensive game-changer have him on top of most draft boards across the country –even while he’s recovering from a torn ACL. 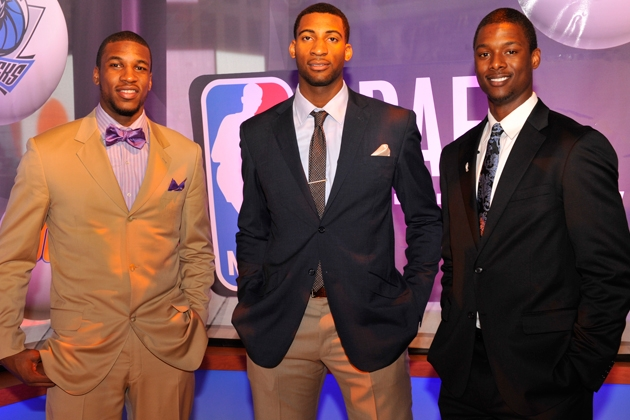 The gentlemen in question are (from left to right) the 2012 NBA Draft’s 5th overall pick Thomas Robinson, 9th overall pick Andre Drummond, and 7th overall pick Harrison Barnes. 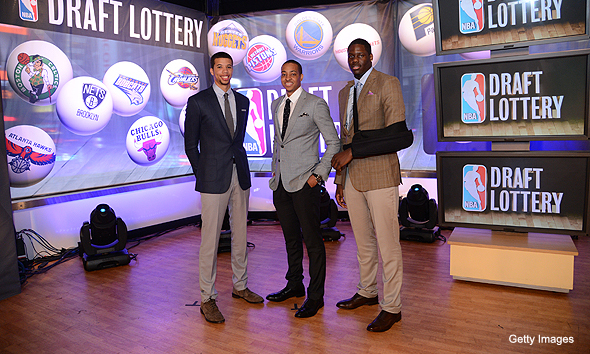 This bodes well for the other three potential lottery picks who attended the 2013 NBA Draft Lottery: Syracuse’s Michael Carter-Williams, Lehigh’s C.J. McCollum, and UNLV’s Anthony Bennett. All three in last year’s photo were selected in the top ten of the 2012 Draft and, should history repeat itself, these gentlemen could very well hear their names called early and often come Draft night. While the Magic may have plenty of depth at both their power forward and center positions (Glen Davis, Andrew Nicholson and Nikola Vucevic, Kyle O’Quinn, respectively), missing out on a potential defensive stopping and game changing center is not what Orlando was hoping for. In past drafts, the Magic have had the opportunity to select both Shaquille O’Neal and Dwight Howard first overall; while neither individual played the majority of their career in Orlando (it’s safe to say Howard will be in the league a while) or won a championship with the Magic, the defensive minded centers did know how to help turn around an ailing franchise. Noel is no definite as the first overall selection, yet having the first pick in the draft would have assured Orlando the opportunity to move their franchise in whatever direction they please. Last season, the NBA and its fans were treated to one of the more talented draft classes in recent history. This season, however, according to many major sporting news and analysis outlets, the NBA and its fans are going to be treated to the “worst” draft class in recent history. Granted, none of these individuals have even recorded a minute of professional playing time and we have no idea who will perform well and who won’t (even though we’d like to think we do). So for so much negativity surrounding the Draft, it doesn’t bode well for the likes of Cody Zeller, Shabazz Muhammad, or any international prospect, none of whom were mentioned during Tuesday’s telecast. This entry was posted in Home, NBA Draft and tagged 2013 NBA Draft, 2013 NBA Draft Lottery, Andre Drummond, Anthony Bennett, basketball, C.J. McCollum, Cleveland Cavaliers, Harrison Barnes, Mayor McCheese, Michael Carter-Williams, NBA, NBA Draft, NBA Rookie Class, Nerlens Noel, Orlando Magic, sports, Thomas Robinson by NBA Rookie Class. Bookmark the permalink.